When it comes to construction safety and project management, the best time to act is as soon as something happens – not days after. Raken’s daily reporting app offers real-time construction notifications to alert construction supervisors of issues as they arise. Raken allows specified users, even those not on site, to received real-time notifications, both email and text message, about safety issues and delays as soon as they are recorded. This eliminates the need to wait until the end of the day when the report is signed to see these issues or be told later on by team members who were there. With our mobile construction app, now you can address problems immediately, even when you're not on site. Stakeholders can also be given real-time updates to avoid confusion and conflict over missed schedules or benchmarks. Instead of hearing about important issues like weather delays and safety issues later on, stakeholders can be kept informed of progress as it happens, keeping everything clear and above-board. Get daily reminders when it is time to complete your safety checklist. Raken lets you customize when we send you a push notification. This way, you can set Raken up to remind you to do your safety checklist when it's convenient for you. 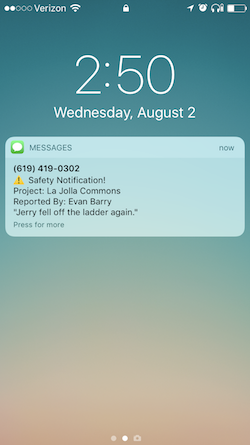 You can also get notified immediately if someone else includes a safety incident in their daily report. Addressing safety issues as they happen helps avoid the ever-present threat of litigation. Raken’s missed report notifications will let you know when a report has been missed so that you can address getting that report completed in a timely manner, eliminating the hassle of catching up later. Specified users can use the notifications to alert them if they have missed filing a report by the end of the day. This can help keep your whole team on target for compliance goals, and ensure safety checklist are completed daily. With Raken's construction safety management app, completing the safety checklist has never been easier. Just customize the checklist on per project or per company basis and the field worker has only to quickly tap their way through the survey before sending it right from their phone. How Do Construction Notifications Help Construction Sites? Real-time notifications give project managers the ability to respond more quickly to safety incidents. Having a robust system of compliance reminders will keep your project on track and on time. Notifications, however, are only a single aspect of Raken’s utility for construction management. Our new integration with Procore, one of the most used construction project management platforms, will let users sync their daily reports and photos with their relevant project in Procore. All important project documents can be stored in one, easy-to-access location with the click of the button. Try a 15-day free trial of our mobile construction app and find out how real-time notifications can improve your construction workflow and improve safety awareness.